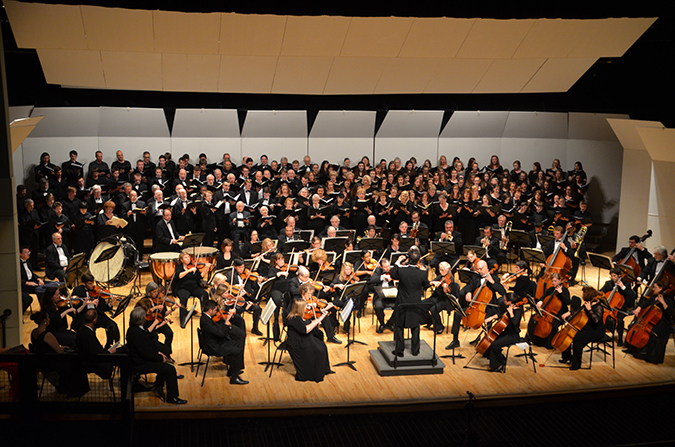 The Oak Ridge Symphony Orchestra & Chorus led by Music Director Dan Allcott will present a regional premier of Lucas Richman’s Symphony: This Will Be Our Reply on Saturday, March 30, 2019, at 7:30 PM in the Oak Ridge Performing Arts Center, 1450 Oak Ridge Turnpike. Beethoven's Symphony No. 3, Eroica, will conclude the thought-provoking program. “As Music Director of the Oak Ridge Symphony I feel a responsibility to seek out works and projects which inspire our audiences and our community. The performance of a great work by a known master is an opportunity to inspire a new generation of listeners and to push our musicians to their fullest potential and affirm our great tradition. In seeking out new works, I look for works that can change us and inspire us in new ways. Mr. Richman, who is well-known as a conductor in East Tennessee, is a wonderful composer whose work the Oak Ridge Symphony has performed recently. When I learned that he had permission from the Bernstein estate to create a new work based on Bernstein’s inspiring words and character, I pursued the opportunity immediately,” wrote Maestro Allcott. * Used by the permission of The Leonard Bernstein Office, Inc. The three movements of Richman’s Symphony: This Will Be Our Reply (Intensity-Beauty-Devotion) expand upon these three directives, exploring the contrasts of great beauty and horrific violence that pervade our modern era. The work ultimately resolves with an anthemic setting of an original poem which frames the ancient Hebrew text, “L’Takken et Ha’Olam (Repair the World),” uplifting the essence of Bernstein’s profound message. A reception, free and open to the public, will be held at 4:30 PM on Sunday, March 24, 2019, at the Beth El Center in Oak Ridge, 101 W. Madison Lane. Maestro Richman will speak about his inspiration for the compostion. Seating is limited. RSVP to office@orcma.org or 865-483-5569. Additional adult and student activities with the maestro will occur during the week. Info at ORCMA.org. Symphony: This Will Be Our Reply was commissioned by a consortium of organizations including the Oak Ridge Civic Music Association, Bemidji Symphony Orchestra and Los Angeles Jewish Symphony for performances in the 2018–2019 season. Major funding for the Oak Ridge Symphony Orchestra & Chorus regional premier is generously provided by UT-Battelle/ORNL. Sponsorship for Mr. Richman’s appearance and activities in Oak Ridge is generously provided by the Jewish Congregation of Oak Ridge and the Stanford Eisenberg Knoxville Jewish Day School. Hotel sponsorship is generously provided by Oak Ridge Holiday Inn Express & Suites, Joseph Valentino, General Manager. Information and tickets are available online at ORCMA.org, at office@orcma.org, or at 865-483-5569. Adult admission is $25; Young Adult (ages 19-29) admission is $10. The Oak Ridge Civic Music Association participates in the Penny4Arts initiative, providing free admission to Youth 18 & Under to ORCMA subscription concerts during the 2018–2019 season.